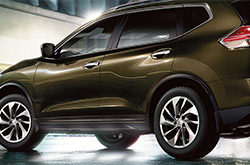 The 2015 Nissan Rogue crossover is a marvel of modern motor vehicle achievement. Designed to be truly unique and fun to drive without sacrificing comfort or economy, this class-leading midsize SUV delivers the reliability, capability, versatility and practicality unseen anywhere on the road today. With best-in-class starting MSRP, mileage, cargo capacity and front headroom, there's nothing else like it on the market. Test drive your 2015 Nissan Rogue in Peoria today and find out why. 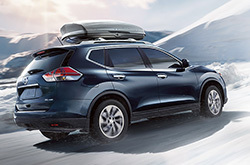 With an efficient but feisty 170 horsepower engine, sporty independent front and rear suspension, NASA-engineered zero-gravity seats spacious interior, and a suite of high-tech amenities, the 2015 Rogue is Nissan's most accommodating SUV ever made. Continue reading our in-depth 2015 Nissan Rogue SUV review below for additional information, specs and more! Boasting Nissan's super-efficient 170-horsepower 2.5-liter Xtronic 4-cylinder V6 engine, the 2015 Rogue is designed with the power to climb, overtake and jump off the line while still maintaining an impressive EPA-estimated 33 MPG highway. Driver-selectable Eco-mode enables the Continuously Variable Valve Timing Control System (CVTCS) to automatically adjust to improve fuel economy, making saving simple. An array of advanced technologies are available as well, from the class-exclusive Around View Monitor system that give you a 360-degree view while parking, to the blind spot and lane-departure warnings, the 2015 Rogue features intelligent innovation that looks out for you. Electronic steering assist and optional all-wheel drive is also available for a smooth and controlled ride. Defended by Nissan's advanced air bag system, with both driver and passenger dual-stage front air bags, seat-mounted side air bags, and roof-mounted curtain airbags, the new Rogue responds dynamically to impacts for comprehensive collision protection. The reinforced passenger compartment and Zone Body construction help redistribute force through front and rear crumple zones for additional impact safety. The 2015 Nissan Rogue in Peoria is available in three trims: S, SV and SL. It features the most advanced arrangement of safety, innovation and economy ever available in its class. Stop in today to see this amazing crossover SUV in action at Peoria Nissan today or continue reading our 2015 Nissan Rogue review below for available inventory, comparisons and more. If you've ever thought about purchasing vehicles like the 2015 Mazda CX-5, Honda CRV, Hyundai Tucson and the Toyota RAV4 in Phoenix, compare Nissan's new 2015 Rogue first; we're positive that it's the right fit for you. The Rogue's leading-edge onboard technologies and low cost are just a few of the noteworthy characteristics that shoppers will be pleased with. When comparing its price to the vehicles listed above you will clearly see that Phoenix Nissan customers select it because it's a truly amazing value. See our Rogue Facts list; look just below this paragraph for bullets. We know your next Nissan purchase is important; that's why we've provided the 2015 Rogue review above, along with reviews of previous year models. Not all car dealers in Phoenix are the same. We feel it's our duty to serve customers with quality vehicle reviews; this sets us apart from the typical dealer. Everything perspective car buyers need to make smart decisions is right here, including info regarding cargo capacity and other specs. Each overview is bundled with valuable facts and specs - all at your fingertips. 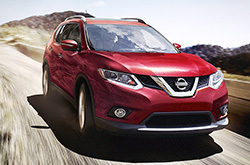 Thank you for viewing Peoria Nissan's 2015 Rogue review. Now that you know more about the Rogue, pick up the phone and call us to learn about current financing offers and OEM incentives that can help you save a significant amount on your purchase.